We have multiple warehouses across the country, to facilitate our customers with fastest delivery times. All orders are processed & shipped on same day IF order is received before 12 noon. Orders received after 12 will be shipped next business day. We ship via Austrilia Post only. We are currently shipping to P.O. boxes but not A.P.O. boxes. If your order arrives and you feel its not right, we are here to fix the situation. We offer 30 days money back guarantee if you choose to but we can just as easily do a size exchange if that is the problem. We promise there will be no nonsense. If you need to replace or return and get a refund we will still welcome you. Sized to fit over jacket. 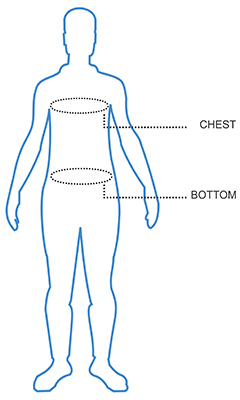 Measure from under/top of one armpit,across the chest to under/top of the other armpit. Then across the back to the first armpit, around the armpits measuring. Note: Measurements listed here refer to your body size not garment dimensions. Please check individual product descriptions for special sizing notes or fit variations. If in doubt order a bigger size.